​Houston Rockets star Chris Paul may have just started the #LeBronJamesBenchChallenge. 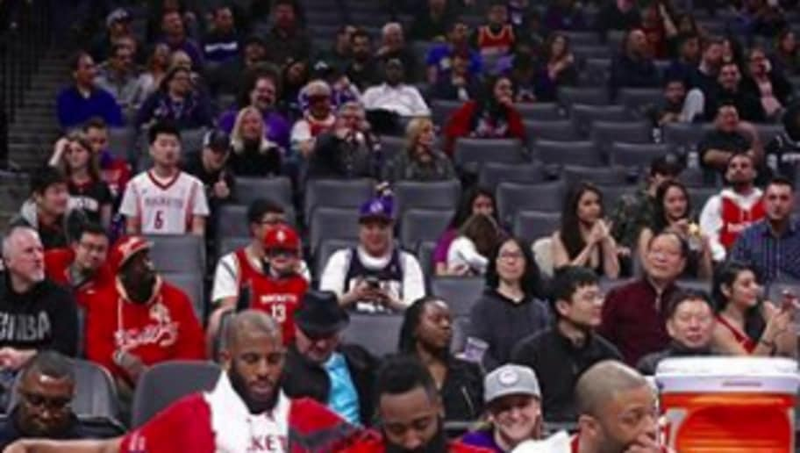 Paul, a member of the banana boat gang, took to his Instagram Wednesday night to poke a little fun at good friend ​LeBron James after a photo surfaced the other night of James ​sitting three seats away from his teammates in a 42-point loss to the depleted Indiana Pacers. Fans had plenty of fun reading into this, especially with the entirety of the Lakers young core being involved in Anthony Davis trade rumors over the past couple weeks, and Paul and his Rockets teammates didn't mind getting in on the action. The best part is you can see every player trying to hide their laughter. With the NBA trade deadline just hours away, it remains to be seen if the Lakers will be able to lock down a trade for Davis. You can tell the trade rumors are getting to the team's young guys, especially with the effort they put forth in Indiana last game. This is no different than when trade talks swirled around LeBron's Cavs this time a year ago. Cleveland suffered two blowout losses to teams they were obviously superior than, but most players had an idea they were being moved and didn't put forth any winning effort. As we know, the trades went down and the Cavaliers ended up making their fourth straight ​NBA Finals appearance. But let's be real...that's not going to stop the trolling.